Many thanks to Alex Tu of Mackay Medical College for taking many of the pictures shown in the slideshow! I am so thankful for the opportunity to have participated in MSCE this summer after having had such a wonderful experience last year. It was such a joy to catch up with old friends after such a long time apart and to form new friendships. Thank you Athena, David, and Alex for the huge blessing it was to see you guys again. Thank you July for being such a terrific partner, definitely the MVP of our TA tandem. And thanks so much to Team Baked Chicken Chops: Amanda, Jessie, Kent, Jeff, and John for making MSCE so much fun! What an amazing thing it was to see our classroom transform from a room full of strangers into one filled with dear friends within the span of just one week! I dare say that I saw many damp eyes that last night as we sang “Precious Corner” together, took pictures, and exchanged gifts and notes late into the night. I hope that we continue to strengthen these friendships, though we are separated by 13 hours and thousands of miles. I hope that these friendships would not draw strength solely based upon one short week spent together, but rather they would be founded upon a common foundation in Christ. And as wonderful as it was to sing about our friendship together that last night, how much more glorious would it be to sing together (for eternity!) about our great Lord and Savior, Jesus Christ. I’m very grateful for the opportunities that we had to share the Gospel with the students during MSCE and I’m so encouraged that they were willing to hear us out and even ask questions to better understand the Good News. My prayer (and please make this your prayer too!) is that God would transform their intellectual understanding of the Gospel into deep and genuine repentance and true saving faith. Soli Deo Gloria! After hearing so many wonderful stories and testimonies about MSCE 2011, I was thrilled to have been blessed with the opportunity to join the MSCE 2012 team. Admittedly, though, my excitement was accompanied by feelings of uncertainty and hesitancy because I’ve had very little mission experience and so I did not have much confidence in my ability to help spread the word of God. But thank the Lord! I was so encouraged by the Christian faculty and students at MSCE, both American and Taiwanese, who truly conveyed God’s love through their words and actions and were all so eager to serve the Lord. It is hard to forget each day at Mackay Medical College, like the hysterically funny morning calls, the early morning bible studies, the Taiwanese and American lectures, Figurerobics (my shoulders ache just thinking about it), Capture the Flag, Praise Night, Shilin Night Market, the Farewell Party, and all the precious time spent with our small groups. Christina H. shares a spiritual morsel. Morning Manna was held at 8 every morning, and all the students and faculty would gather in a small classroom to eat breakfast together. Morning Manna was a particularly enjoyable time for me at MSCE because I was able to catch a glimpse into the lives of my fellow TAs and be inspired by their powerful testimonies. It was so heartwarming that the Taiwanese students had such open hearts, willing to learn about the Gospel. Although our time together at Mackay was limited, I felt that everyone lived each busy day to the fullest, establishing deep-rooted relationships and meaningful conversations anytime, anywhere. Transitioning from the first week at MMC and preparing for the second week of service in Chiayi and Alishan was challenging, but not a passing second of our short time with the children of Sianglin Elementary School was wasted because of the spirited guidance of Laura, Richard, and Yawen and the swift adaptability of our American team. We were able to teach the children valuable skills, as well as instill in them an understanding of God’s faithful love. Although our last day at Sianglin was bittersweet, I was glad to see that we were able to touch their hearts in some way, just as our own were moved by them as well. These past two weeks in Taiwan have been such a bountiful harvest for me, spiritually, emotionally, and educationally. It is undeniable that it was by God’s arrangement that we were able to meet like this to serve Him because in a short two weeks, so many people were brought together to inspire, love, and challenge each other. I hope that MSCE can continue to serve as a spiritual and educational hub for students, despite the immense geographical separation between Taiwan and the US. I’d like to thank everyone that helped make this camp so memorable, my dear faculty and TAs, students, and my “Flying Mice” and Star(fruit)s! Also, thank you so much to those who have kindly supported us financially and kept us in your prayers. I miss you all! 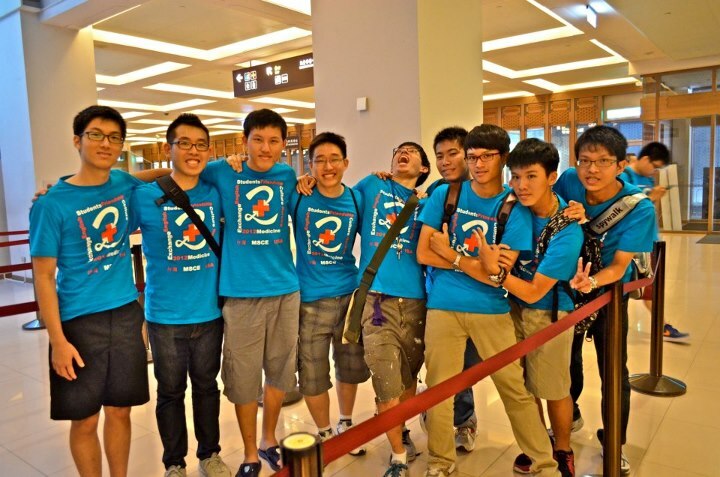 The MSCE camp in Taiwan was a blessing for me. Before the camp started, I was unsure how much I could contribute as a pre-medical undergraduate with a recently rediscovered faith in God. I was unsure where I was going as a Christian, so I had trusted God to provide the next step. Well, God did indeed use this camp to show the next steps in my faith by giving me amazing teammates and students. 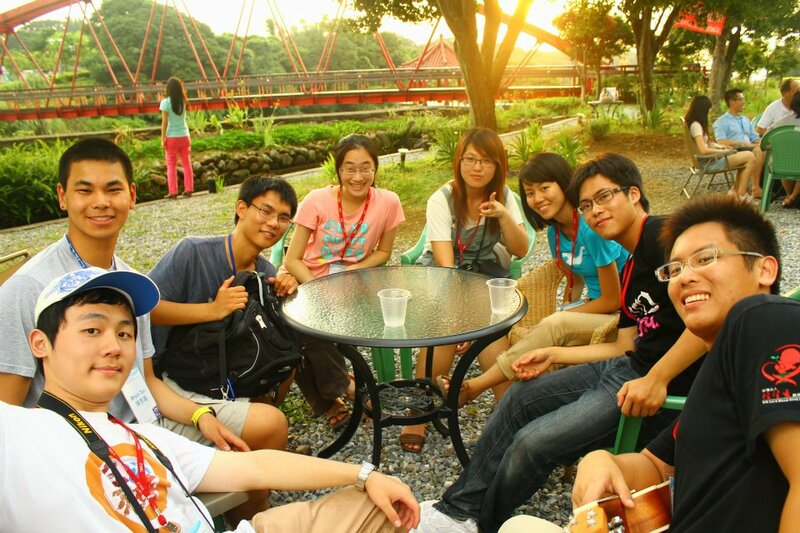 My brothers and sisters in Christ were able to show me Christian lifestyles, while the Taiwanese friends’ openness to everything made it easy to open myself to them. I was able to discuss religion with my roommate 江建霖 (Jack), talk openly about ourselves and our dreams with my small group Team Kung Fu, and receive the love poured out from the rest of the American TAs. Throughout the entire week, I felt God’s presence shaping all of our lives in Mackay Medical College. Regardless of whether we were discussing healthcare or playing capture the flag, everyone in the camp was able to form strong bonds with each other. Our second week in Chiayi and Alishan provided more time for the American students (and some new Taiwanese friends) to connect even more strongly. I feel blessed to have had this opportunity to meet new friends and develop many lasting relationships. Furthermore, these two weeks have been a huge part of my personal growth, spiritual and otherwise, and I’m so happy to have been a part of MSCE. Thank you to all the TAs, students, and especially staff who collectively made this experience possible. Also special thanks to Team Kung Fu for being awesome and to Christina Han, Louis, and Richard for dealing with the fourth graders in Alishan for me! When I signed up for MSCE 2012, my main goals of the trip were to learn and share. At the end of the trip, I am glad to say that I have shared my story and impacted the lives of some students, but I have also learned much more. 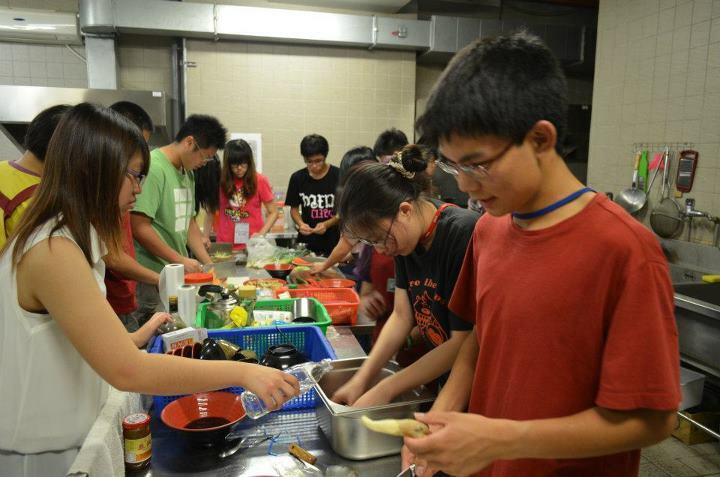 Throughout the Mackay camp, the students and TA’s bonded through various activities like fun night, the language activities, capture the flag and more. As we became more like a family, we shared deeper about our lives and views of each other, either through group discussion time, lunch time, or otherwise. I learned a lot about Taiwanese culture (great food and places to visit), some funny stereotypes the students have of Americans, struggles they face regarding accepting Christ, and more. It was through learning and discussion that I was able to share a lot of my story, of how I grew up in Singapore, how I came to know Christ, and the challenges I encountered even after knowing Him. I felt God’s hand in planting the seeds in these Taiwanese students. When a student approached me to ask me more about my testimony, he said that he did not usually dare to ask about questions relating to Christianity. However, at that moment, he suddenly felt more comfortable and natural talking to me. It was similar for my roommate, and several other students, when they asked me about Christ. I was inspired by how they thought so deeply about Christianity, in a way I never did before coming to Christ. unpreparedness that I felt God work through us, pulling us together and showing us the strength of this mission team. Thank you to the faculty for guiding us, to the other TA’s and students for making this trip a blessing to me, and especially to Circle Team and Team Superman! Looking forward to MSCE next year. MSCE was an amazing experience filled with unforgettable fellowship, lasting relationships, and plenty of eating and mosquitoes! More than just medical cultural exchange, this camp was an eye-opening preview into the vastness of God’s love for His people in Taiwan. Hanging out with our students (Group 7: Baked Chicken Chops!) and singing songs to our great Father as an entire camp were some of my biggest highlights of the program (amongst many other things!). The relationships I formed with our students and the rest of the MSCE program brought me a lot of joy and a desire to come back next year. In spite of being in such a secular environment, there were a lot of welcoming hearts willing to hear the good news. God made sure that seeds were planted on this trip and I continually pray that these seeds will be watered and nourished. Everyone on this trip was a blessing in their own special way and I am amazed at how God was able to bind us together in spite of meeting each other one day before the start of the program. On a last note, I have never lost my voice in my life, so to say that I lost my voice for the first time torwards the end of this camp is a testament to how amazingly fun MSCE was! Thank you team Baked Chicken Chops for making my experience in Taiwan memorable (thanks Amanda for being willing to dress up as a boy) and thank you to my amazing partner David Kuo for helping lead our group! Lastly, thanks Olivia and Edward for helping me survive my second week at Alishan! Before I left for Taiwan, I prayed that God would use MSCE to broaden my heart for East Asia and to unify our team…and He was able to do “immeasurably more than all we could ask or imagine” (Eph. 3:20)! I could not have asked for a better first trip to Taiwan than through MSCE as we talked with people from all ages and walks of life. I saw God’s love and relentless pursuit of his creation come alive, regardless of their age, gender, social status, income, and diseases and infirmities. The Taiwanese I met (especially the students in our MacKay camp) were not just content to talk to me about their culture; they delighted for me to be an active participant in it in my walking, my sleeping, my eating (and eating and eating), my singing, and my speaking. Our team, once a team of strangers, became a second family as we enjoyed fellowship through joyous (and sometimes drowsy) days and sleepless nights. I learned so much from my teammates’ gifts and response to their weaknesses. I will never forget Gene’s supernatural (IMO) patience in dealing with a foreign language, Olivia’s sacrifice of sleep to preach the gospel, Edward’s logistical skills, Enrique and July’s powerful testimonies, and Laura’s frank and fun leadership, among so many blessings from my teammates. This small group found out that their first names spelled BAD TRAP. Voila! Small group name. If a mission trip had a theme verse, 1 Corinthians 13:12-13 would be it: “Now we see things imperfectly, like puzzling reflections in a mirror, but then we will see everything with perfect clarity. All that I know now is partial and incomplete but then I will know everything completely, just as God now knows me completely. Three things will last forever – faith, hope and love—and the greatest of these is love”. (NLT) A beautiful portrayal of man’s view of the world in comparison to God’s majestic plan, it is also a reminder that as servants of the eternal kingdom, we are merely used to plant and reap the seeds of faith (Mark 4:26-29). God is ultimately the one who performs the most important work—the watering and growth of the little mustard seeds of belief. During this trip, I was privileged to be both a planter and a reaper—being able to introduce knowledge of the Good News into the lives of these students and also play a part in the salvation story of a new sister in Christ, Donna! As God’s ambassadors to the Taiwanese children and students, my team and I were able to minister for two weeks, both in New Taipei City and Chia-Yi. This trip taught me how to view healthcare on a global scale, and developed cultural competency, amidst other vital skills to learn as a future physician. I was also impressed by the student presentations and the necessary courage to speak in broken English in front of an audience which included native English speakers. Also, I also highly respect and admire the flexibility of some of my team mates, who were not completely fluent in Mandarin Chinese (one was Korean!). They painstakingly practiced pronouncing songs and phrases in pinyin or used body language when words stopped at the language barrier. Their love for others was so evident by their dedicated servant’s hearts and response when faced with obstacles. Becoming close friends with many of those involved, I am sure this was just the beginning of a lifelong relationship between those on different sides of the world. I was blessed with a wonderful roommate (Alice), a partner TA that compensated for my weaknesses and lives a life exemplifying his faith (Joseph), excellent role models who served as faculty (Paul, Tony, Margaret, James, and Laura), American team members that became much like a family, Team Kung Fu (my Mackay small group) and Taiwanese student mentors who so lovingly spent countless hours with us teaching us how to work with children and some Chinese praise songs! From the Alishan children being moved to tears at realizing our time with them was over to all-night discussions that resulted in softening of hearts towards the Gospel message, I was so amazed at the open minds of the students, the unfailing strength of our Lord and the small glimpse into His eternal plan for each and every individual. I hope I was a blessing to the lives of the people I encountered as much as they have blessed me! These precious children, students and team members are so beloved in the eyes of God, a “special-ness” that cannot be taken away by anything. I was also able to view the work of the Chia-Yi Christian Hospital physicians, workers and volunteers within the community, from the Evergreen Garden , a senior facility, to the Renewal Garden, which enables the physically and mentally disabled. I hope to be this type of physician: one that treats each individual with respect and integrity, lovingly equipping the ill and handicapped with ways which promote intrinsic healing and make an impact in the community. An eye-opening experience, I hope you will consider joining in the upcoming 2013 MSCE! Thank you for all your spiritual and financial support. My trip to Taiwan was a crazy new experience. Not that I haven’t been there before, because I have, several times. However, this time I wasn’t going with family, so I had no idea what to expect from the country or the program. Even when I arrived at our rally point, Hongshulin station, and saw the faces of the TA’s I had so delicately stalked on the internet, I was unprepared and clueless about what I was going to be doing and why I was doing it. 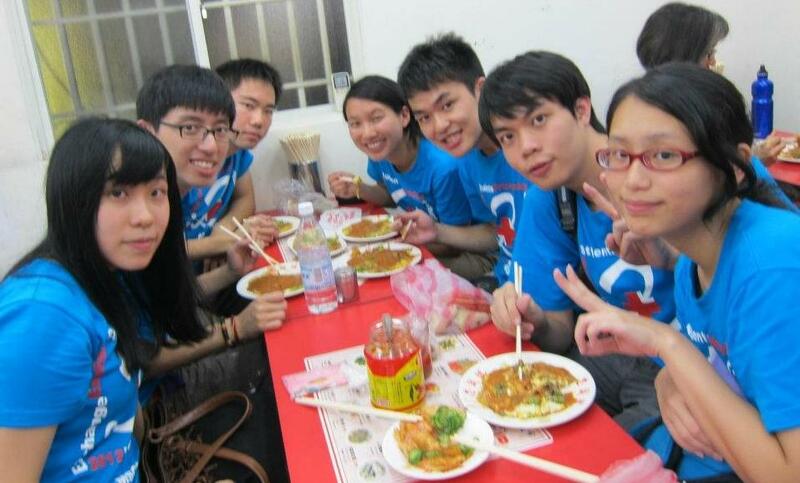 / I did know, however, that I was to be interacting with Taiwanese medical school students. I was intimidated. As a rising sophomore at Wheaton College, I was the youngest of the TA’s and one of the youngest overall. I had no idea what I could offer them. This incompetency, however, was a strength. I felt exactly like Jeremiah. I was young. I was a mess. Nowhere within me lay the capabilities to adequately contribute to this cultural exchange program. I also was stuck on how I could possibly share my faith and love with these people I didn’t know how to relate to. And lastly, I was also trying to cope with the death of a close family member, who didn’t share my faith. Most people would easily say that I wasn’t the man for the job. However, that’s not how God operates. He doesn’t call the equipped. He equips the called. My incompetency was a strength because it forced me to rely fully on God. He quickly showed me that he was there with me. The “Bah-chang” group decides to eat o-a-chian, not bah-chang. Just two to three days into the program, I knew that MSCE was where I belonged. I fell in love with Taiwan and her people. My roommate, Louis, went out of his way to get me bubble tea, among other things, to make me more comfortable. I and my co-leader Sarah Cheng, quickly bonded with our group- the bah-tsang ( 粽子), spending many a joyful moment laughing over videos of dogs or playing bunny bunny! Thursday night at the night market, as I shared a stinky tofu and oyster omelet with my group, I remember clearly thinking that there was no one on Earth I would have then traded places with. Most importantly, I was able to share my faith in a way I never expected to. God reconciled himself with me, and allowed me to give my testimony on how I learned to cope with the death of a loved one- through what happened at MSCE. 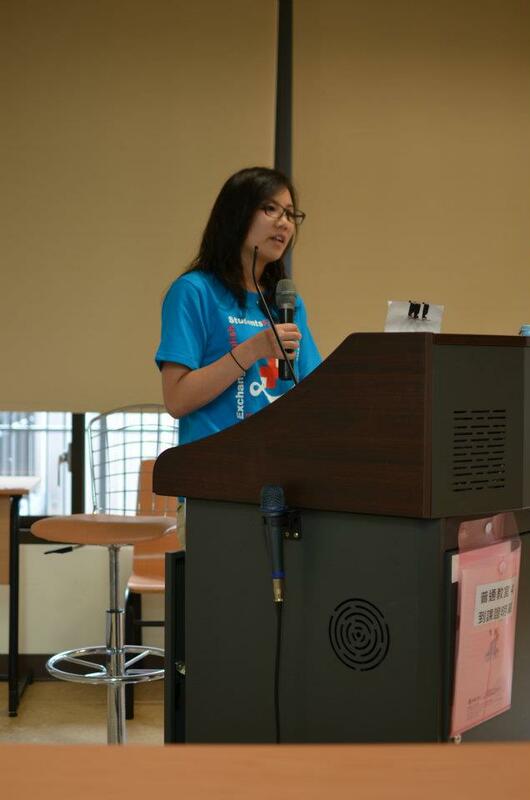 In the end, even with my mediocre Mandarin skills, it was a huge enough blessing that God was able to use me in Taiwan. A desire to relate to the Taiwanese, my people, opened up in me. So coming this fall, I’m starting with Mandarin 101! I would like to give special thanks to the faculty, both Taiwanese and American, as they allowed me to join them in their mission and cared and prayed so deeply for all the students. It was one of the biggest blessings I’ve ever experienced. I would also like to thank the students from all sides showing me such love and friendship. This will never be forgotten. Wo ai ni! The MSCE camp was a very inspiring and encouraging experience for me. I have to admit that in the beginning I had no idea how God was going to work and how we were going to share the gospel amidst conducting a camp consisting of lectures about American Culture and Healthcare. I quickly learned that because of the openness of the Taiwanese students to engage in English conversation, and their willingness to speak about God, their beliefs and their convictions, the gospel was naturally shared. Out of the 40+ students that attended the camp, only seven of them were professed Christians (quite humbling considering that Mackay is a Christian Medical College). I could see that the Taiwanese students were very eager to speak about deep topics such as the meaning of life and faith since they don’t do so very often. In particular, I really enjoyed being able to share my faith with my roommate Donna (who accepted Christ during the week!) and my small group students: Jian (who was in my husband Daniel’s small group last year), Nielson, David, Joy, Jessie and Yvon (Jessie and Yvon were both Christian, a huge encouragement to me). 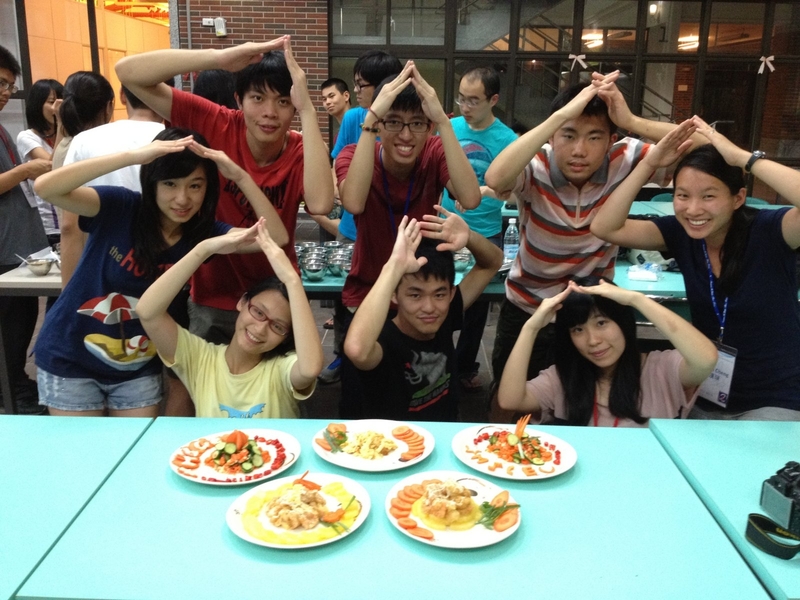 Together, with my co-TA Derek, we formed team “Bah Tzang” (the delicious Taiwanese steamed rice treat). Some of the team-bonding highlights of the camp included the cooking contest (which our team won by carving fancy carrot designs and Jessie’s amazing cooking skills), the trip to the night market (where Derek tried stinky tofu for the first and last time), and the farewell party (our team performed a creative rendition of a Taiwanese drama play- very funny). Some very special memories for me were being able to lead worship during the praise night and see the Taiwanese students singing along, having deep intentional conversations with my students about their struggles with believing, and being able to pray with and for my students on the very last day. I also really appreciated all the sharing that took place during morning bible study and morning manna. We were greatly encouraged to see that at least half the group that showed up to early morning bible study consisted of Taiwanese students that were curious to learn about the bible. My time with the Mackay nursing students was also very memorable. As much as they were encouraged by our joy and contentment in choosing nursing above other professions, we was touched even more by their commitment to nursing despite the added difficulty in Taiwan (larger patient load and less salary). To end, I’d like to conclude with a statement that my new and very good friend Yvon shared with me. She shared that to her, as a Taiwanese Christian student, it was very encouraging that our team would come all the way from the US to teach English and conduct a cultural exchange camp as a means for planting spiritual seeds in the hearts of these Taiwanese students. Our hope and prayer is that these seeds will grow and be nurtured into a true and lasting faith in Jesus Christ. I am so thankful that I had the experience of participating in the MSCE camp this year and look forward to seeing it grow and flourish over the years to come. My time serving in MSCE was nothing short of an amazing experience. Coming to a Taiwan summer camp for the fourth time, I had high expectations for this program, and I can truly say that all of them were met, specifically in the area of evangelism. Each day, we were given the opportunity to lead a Bible study and a morning manna, both of which were essential for students to learn more about our Lord and Savior Jesus Christ. We also had a Praise Night that allowed students to hear gospel-centered songs. I can take joy knowing that all our students heard the gospel multiple times during that one week. My group namely the Chimichangas was such an exceptional group of students. All of them were eager to learn about medicine and nursing, as well as our lives and faith. One of my students actually expressed interest in reading the Bible and came to church with us after the end of the program! I miss them very much as well as the TAs and the new friends I made in the program. Personally, I believe this is a program that needs to exist in every college campus in Taiwan. 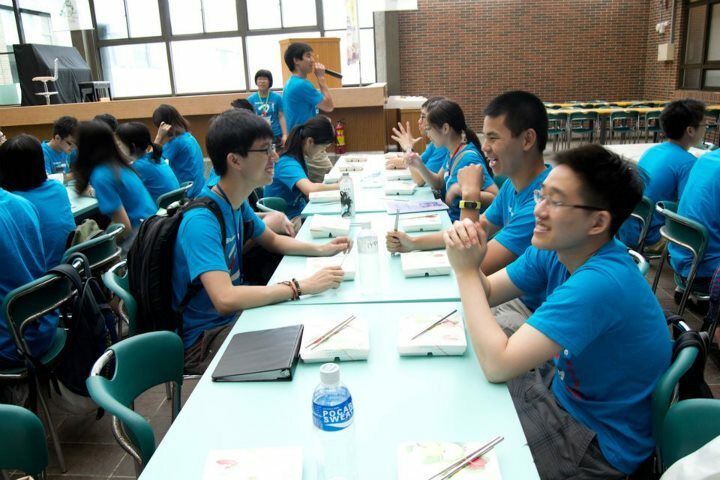 Taiwanese students are in need of the gospel as much as here in the States, if not more. My hope is that this program continues to grow and serve more students for many more years to come. Lastly, I want to thank our supporter from LCMM. It baffles me that although we never met in person, you were generous in your financial support and prayed for us consistently. We appreciate for everything you have done. Thank you! This was my first time back to Taiwan since I left when I was 6 years old. It was a spiritually emotional experience for me, even more so than I expected. I had grown up with a vague knowledge of my family ties to the Rev. George Leslie MacKay. My family owes him our spiritual as well as our family heritage. Like Rev. MacKay, I too attended Princeton Theological Seminary and I too was ordained as a Presbyterian minister. But while Rev. MacKay was called to serve the people of Taiwan as a missionary, I was called to serve churches in America as a pastor and now as an academic. Our calling had little overlap until this summer when I returned to Taiwan to be part of the MacKay Cultural Student Exchange program. It was extremely humbling for me to preach the Gospel during Sunday service at the chapel of MacKay Medical College. To preach the Good News of Jesus Christ in Taiwan, as Rev. MacKay once did, was an honor I will always treasure. My heart continues to be filled with praise as I thank God for the privilege of enjoying His presence in Taiwan. As the camp got started, I was immediately impressed by the spiritual maturity of the American TAs who went on this trip. I give my highest compliments to Dr. Paul Cheng and others who helped in the selection process. They could not have picked a better team. This talented and faithful group of young men and women connected with the Taiwanese students right away and passionately shared the love of God with them. It was personally encouraging to see so many young people tirelessly working together for the cause of Christ. 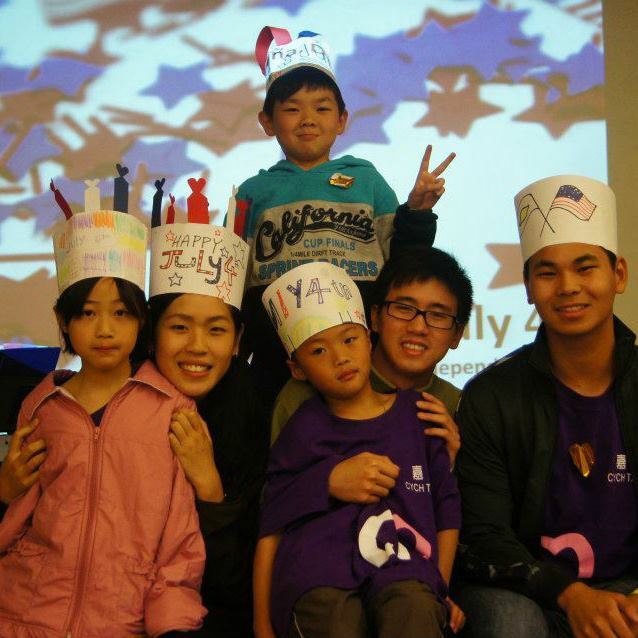 Taiwanese students, American TA, US university faculty– can you tell? I was also glad to meet the Taiwanese students at MacKay Medical College. Through them, I was able to learn much about the Taiwanese educational system, the health care system, but more importantly they lived out their culture with me. Though I was born in Taiwan, I know little about life in Taiwan so I am especially thankful to them for teaching me, in essence, my own cultural heritage. As a sociologist, it was fascinating to see Taiwan’s religious pluralism but even more interesting to converse with the students who embodied this pluralism in their lives. Throughout my conversations with them I was able to get a glimpse of their struggles and their dreams. My heart yearns for the people of Taiwan now more than before. Finally, I want to thank all those who supported this program through their finances and prayers. In ministry, some are called to send and some are called to go. You faithfully answered the call to send us and your support has transformed lives. So thank you.